The filament maker Polymaker has announced a new line of Polycarbonate-based filaments for extrusion-based desktop 3D printers called Polymaker PC. The first two members of this new material family are Polymaker PC-Plus and PC-Max, which have been formulated and engineered to bring polycarbonate to the Extrusion-Based Desktop 3D printers. They have achieved this by lowering the printing temperatures from 300 – 320ºC down to a moderate 250 – 270ºC, and significantly improving the warping resistance. Polymaker PC-Max further offers advanced mechanical properties—toughness, in particular—making it suitable for mechanically demanding applications. – Heat Resistance: Unlike projects made with PLA or ABS material, those made with Polymaker PC will withstand temperatures of well over 100ºC. This makes it ideal for lighting, engineering, and practically any device or part that requires good structural stability when exposed to heat. – Excellent Mechanical Properties: being one of the most widely used engineering plastics in the world; PC has an excellent reputation for mechanical properties. Polymaker PC inherits these qualities while being fully compatible with desktop 3D printing. Parts made with Polymaker PC show much improved mechanical strength under almost all different deformation modes. Polymaker PC-Max further provides excellent impact resistance and toughness. – Post-Processing Capabilities: Polymaker PC can easily be post processed by sanding, coating, or other methods to suit the users’ functional needs. – Additional functional properties include intrinsic flame retardance, optical clarity, and resistance to chemicals and solvents. 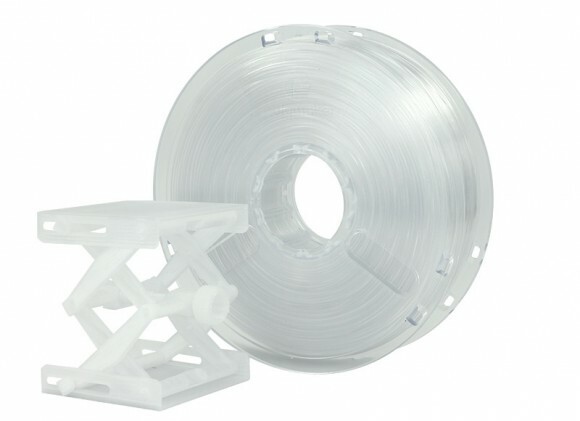 The Polymaker PC-Plus filament should be available for ordering starting next month (October) in 1.75m and 3mm versions on 750 gram spools with Transparent color as the only option for now and with a price tag of $39.99 USD. The Polymaker PC-Max should be available before the end of this year and there is not yet information regarding the price of that filament.